Ferrari welcomed us all a little bit early to the Hotel California, and yes, it's a lovely place. 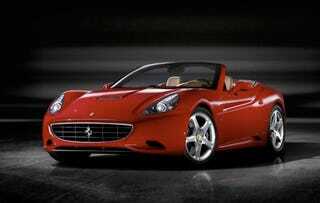 In fact, check out the lovely face on the new 2009 Ferrari California just to see if we're wrong. Despite being told we'd need to wait at least another week before shots would officially go live, the prancing stallions at Ferrari have revealed three press photos of the new Ferrari that's been alternately called the "Ferrari GT," "Ferrari California GT," "Ferrari Dino" and "Ferrari Little Tiny One" in the spy photos. OK, maybe not that last one. But the rest of them are accurate. Whatever we used to call it in the spy photos, it's now set to take on a bit of West Coast flair. We'll be pleased as punch to see it in person in Paris later this year. For now, check out the photos below and press release after the jump.